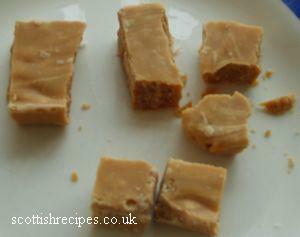 Scottish Tablet Recipe is also called Scottish Toffee and will help keep your dentist in business! But well worth it. It has a delicious crumbly sweet sensation with a lovely butter aftertaste. High in calories and sugar, so great as an occasional treat. 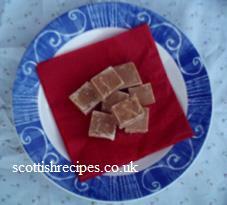 Eating in by Sue Lawrence has a traditional Scottish tablet recipe using vanilla extract. The book The Scots Kitchen by F. Marian McNeill suggest using an enamelled saucepan when making Scots tablet. It also has flavourings which include cinnamon, coconut, fig, ginger, lemon, orange, peppermint, vanilla and walnut and gives guidance on how to easily add these. 1. Melt the butter and sugar. Add the condensed milk and the teacup of milk. 2. Stir and turn up the heat and keep stirring until it reaches boiling point. The book Nick Nairn's New Scottish Cookery suggests an optional ingredient of grated white chocolate. Whilst Scots Cooking: The Best Traditional and Contemporary Scottish Recipes by Sue Lawrence suggests adding a teaspoon of pure vanilla essence to tablet recipes. 4. Remove from the heat and beat 60 times with a wooden spoon. Put a wee bit on a plate and if it sets then it's ready to be put onto the shallow trays. 5. If you would like to make it more crispy then add a drop of vanilla extract and a table spoon of syrup at the last moment and stir for a couple of minutes off the heat. 6. Score the surface marking into squares and allow to set and get cold. 7. Best washed down with Irn Bru! 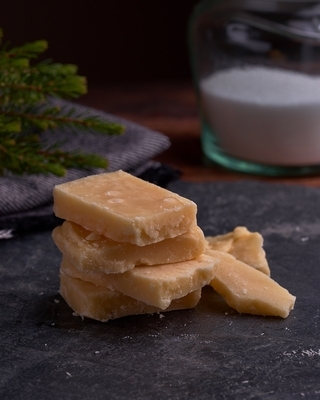 The book Sue Lawrence's Scottish Kitchen: Over 100 Modern Recipes Using Traditional Ingredients has a white chocolate and cardamom tablet recipe. Sue Lawrence in Eating in writes about the earliest mention to a Scottish tablet recipe in literature which she traced to The Scots Household in the Eighteenth Century by Marion Lochhead. 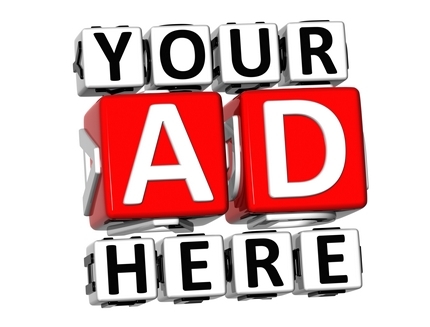 Early ingredients and cooking methods are included.